Phyllis Tuckwell’s touring exhibition details the 40 years from its inception to the current day. 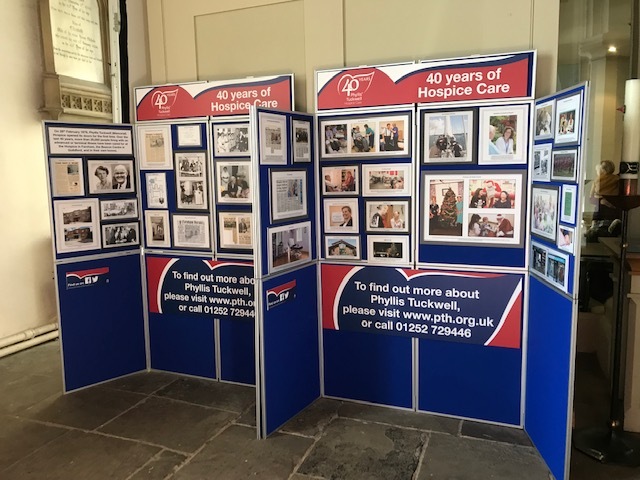 Phyllis Tuckwell Hospice Care turns 40 this year and, to celebrate this special anniversary, it has created a touring exhibition which details its history. Featuring photos, press cuttings and invitations, along with details about how the charity was first created and has developed over the years, the exhibition is a fascinating insight into how an idea in the minds of a determined few has grown into a well-loved charity which cares for around 2,000 patients every year. Named after local mother of three Phyllis Tuckwell, who died of cancer in 1970, the charity was founded by her husband Sir Edward Tuckwell, and provides supportive and end of life care for local patients and families who are living with an advanced or terminal illness. In its first year it cared for 250 patients, but now supports over 250 patients, relatives and carers every day, offering care at the Hospice in Farnham, the Beacon Centre in Guildford, in patients’ own homes and in the community, through a mix of medical and nursing care, therapies, counselling, social work advice and practical support. The exhibition will be touring the charity’s catchment area of West Surrey and North-East Hampshire throughout the year, where it will be on display in local towns for a few weeks before moving on. It is currently on show at the Town Council offices in Farnham, after which it will travel to Godalming, and then on to Aldershot, Farnborough, Fleet, Guildford, Camberley and Crondall, finishing in Haslemere in November. If you are able to, do pop and see it when it’s in your area, and find out more about how this important charity was founded, and how it serves the local community today. You can view the schedule detailing the dates and towns it will be visiting below.